Cyclists in the City: Oval junction - proper cycle tracks, internationally high-standard junction, proper everything. This plan is fantastic. Needs you to tell TfL likewise. Oval junction - proper cycle tracks, internationally high-standard junction, proper everything. This plan is fantastic. Needs you to tell TfL likewise. Plans for serious, usable, safe, practical cycle tracks at Oval. Just look at it. Doesn't it make you hum? 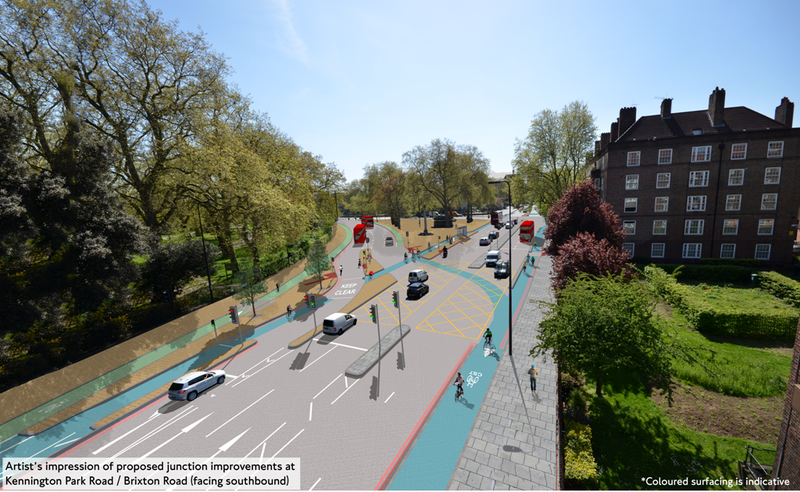 On the same day that Transport for London published its plans for the Oval to Pimlico bike track, it also published plans to sort out the truly terrifying Oval junction.My understanding (I may be wrong) is this scheme is intended to be in place by October (same as Vauxhall). Please please please take a look at the TfL page and send in your comments on this scheme. Some of you may remember that it is three years since Mark Ames and I organised the Tour du Danger, a bike ride to protest about this and other killer junctions. We set off from Oval junction. It is here that Catriona Patel was crushed to death by an HGV driver who had been disqualified 20 times and was on his mobile phone at the time. Countless others have been seriously injured here. The problem at Oval is that you have three A-roads meeting across two different junctions with large volumes of traffic in multiple lanes, at high speeds. And into the middle of that was plonked some blue paint for people on bikes to follow. The current set-up is downright dangerous. The whole place is just grim. What TfL is - at last - proposing here is pretty magical. I have to say this is, in my view, best-in-class cycle infrastructure. 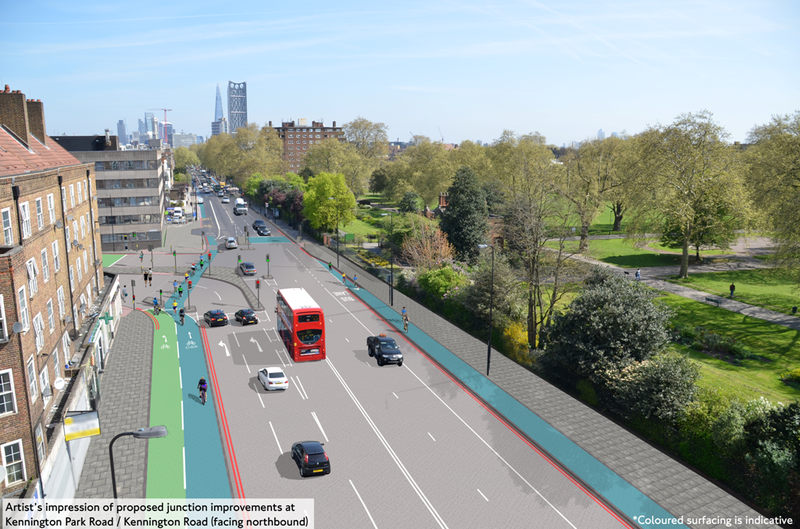 The idea is that TfL will build cycle tracks through the junction that keep cyclists away from fast-moving motor vehicles and that have separate traffic light flows to motor traffic. The routes are just as direct as the motor traffic routes. The quality of the tracks is extremely high. The whole thing makes sense. It is logical, simple, easy to use and friendly for people at any speed on a bike. And what's more, the tracks take you from the start of the junction and all the way through. In fact, I can't see a single point where a bike movement would come into conflict with a motor vehicle movement. That, surely, has to be better for everyone, motorised or not. If you're heading north from Stockwell, you'd enter a bike lane at Oval station (currently shared with motor vehicles turning left and with buses going straight on but the left turn will be banned and buses will need to move over a bit) then carry along a 2-2.5m wide stepped or segregated bike lane, go behind the bus stop, then into a bike-only junction where you either turn left towards Lambeth North or straight on towards Kennington. Wait at the lights here, then continue straight on at the same time as the motor traffic and then on into the bus lane to take you up to Kennington. What is not to like? This scheme pulls you out of the motor traffic flow but gives you something serious that is designed for bikes instead. Pedestrians also get a straight across crossing on the one side road to enhance their priority too, which is something of a first for a TfL road. My only questions around this section are a) whether the track is going to be able to cope with massive volumes of people who bike through here every morning and is a 2m track wide enough b) will the track behind the bus stop be smooth and easy to use or will it be clunky and awkward like the ones at Bow c) will the traffic lights at the end by Kennington Road give enough time for everyone to get through on their way up to Elephant because if not, people won't use the track. We do need some assurances that these points will be made to work. Heading south is pretty much the same sort of thing. You enter the bike track just by the park, filter into the bike-only left or straight ahead lane. At no point will you suddenly find motor vehicles cutting across you. You just amble on straight ahead, wait at the lights and go with the rest of the motor traffic. Left turning motor vehicles wait for the lights, just like in New York where this is standard practice now. 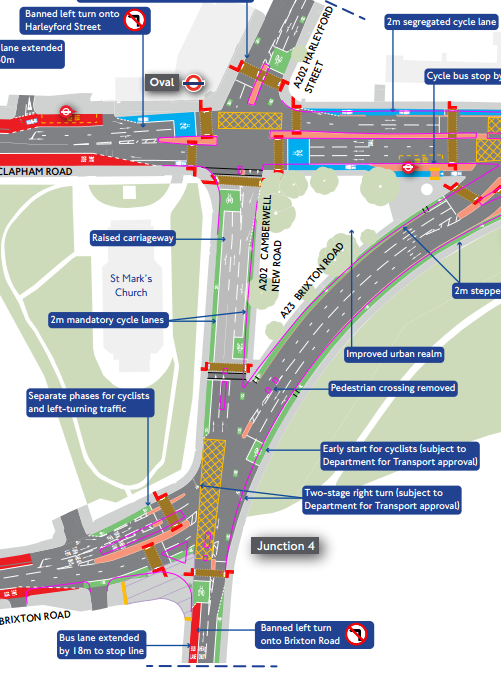 Oh, and if you're cycling towards Brixton, you don't wait, you just pootle on down to Brixton.The only bit I'd strongly criticise here is that at the end of the Brixton Road triangle heading towards Brixton they are suggesting a early-start traffic like for cyclists (like at Bow). I don't think this would be helpful. They should just move the advanced stop line well forward of the general traffic stop line and people will have time to get away before the general traffic. Otherwise, there's a risk this part of the junction becomes too cumbersome and people won't (I fear) observe the lights. For the rest of it, though, this scheme hums. It just does. Heading up from Brixton? No more dodging buses. You get a separate lane, separate traffic lights and then proper 2m wide stepped bike lane up the funny triangle bit in the middle there. No more 1m wide 'advisory' cycle lane. A real, meaningful, safe, serious, proper bike lane that keeps you and the millions of buses on this section apart. Seriously, this thing makes me grin like Christmas has come early. There's even an improvement for pedestrians here with a single crossing of Brixton Road rather than the currently very unfriendly two-stage crossing where you stand around on a narrow road island for two minutes. It says 'get on a bike'; it says 'trust and obey the infrastructure and the lights'. Why? Because they are actually designed, for the first time ever, for a rational, person a bike. There are some gripes. Turning right from Camberwell towards Kennington? Not sorted out. Harleyford Street from Oval tube to halfway around the Oval? Rely on bus lanes. It also doesn't fully resolve the right turn that people have to make when cycling from Kennington towards Brixton into Brixton Road. You get to the end of a wonderful bike track here (near where the Junction 4 is on the map) and you're stuck having to zoom off in front of snarling traffic from an advanced stop line. But then, the scheme never undertook to solve this part of the junction in this first stage, and the rest of that part of the junction is a clear and significant step up. Proper bike tracks, sensible path-finding. Proper adult stuff. To my mind, this scheme works. It works for the thousands of sporty racer folk who zip up and down here from Clapham. It works for the slightly slower, more interestingly-dressed people who cycle through here from Brixton. And, most importantly, it would work for people who don't bike here yet because it's too darn scary. There are a few bits that can be tightened up. The entry at Oval station heading north, for example. The Brixton triangle junction heading towards Brixton too. But, for the most part, this thing sings proper-bicycle-infrastructure. And it's what the Mayor should have built the first time round. Still, let's get this on the ground. It would be amazing to make this a reality. Send in your views to TfL on the online consultation form.